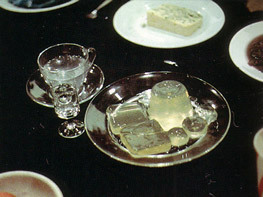 The famous 1960s’ and 1970s’ Fluxfeasts and Fluxbanquets – which boasted menu items such as George Maciunas’ Fish Meal (fish drink, fish jello, fish bread, fish pudding and fish ice cream), and Bici Hendricks’ Black Meal (black drink, black beans, black meat and black sauce) – followed very much in the Futurist tradition. They elevated the visual, olfactory, tactile, masticatory and digestive experience to the level of art. More importantly, they intervened into the syntax of interactive social relations. Taking its cue from Pierre Bourdieu’s notion of the ‘magical divide’ (1979) which is a culturally conferred physical, aesthetic and moral differentiation between the delicious and the disgusting, the beautiful and the ugly, the ‘done’ and the ‘not done’, this paper explores the relationship between Flux Food and the received cultural ideas about taste. It examines the intermedial provenance of Flux Food; its monomorphic structure (which resembles a theme variation); and the proposed eating practices (behavioural and choreographic requirements). On the basis of these explorations the paper argues for a paradoxical articulation, which, instead of adhering to the dualist paradigm inherent in the ‘magical divide’, seeks to differentiate within sameness, and, conversely, identify within difference.